On board the steamship Luminary, the 16th Ohio continued north on the Mississippi River passing Columbus, Kentucky, at 3:00 am. The ship docked at Cairo, Illinois, at daybreak. This would be the last day the 16th Ohio would travel by steamship. The troops disembarked at Cairo in the morning and marched to the railroad depot where they had breakfast. At noon, the soldiers boarded Illinois Central Railroad freight cars and were soon on their way north and east toward Columbus, Ohio, and home. Pvt. Robert "Newt" Gorsuch, Company B, tells us the regiment changed trains in Mattoon, Illinois. Since the regiment left Cairo aboard the train at noon, and using an estimate of 25 miles per hour for steam trains during this era while allowing for several stops for fuel, water and passengers, we will make an assumption the regiment arrived in Mattoon, Illinois, about 10:00 pm and then waited for several hours before changing trains to take them east to Terre Haute, Indiana. Having started their journey home to Ohio late on the night of October 6, 1864, at Morganza, Louisiana, this period map shows the approximate route of the 16th Ohio on board the steamer Luminary, which took them to Cairo, Illinois. 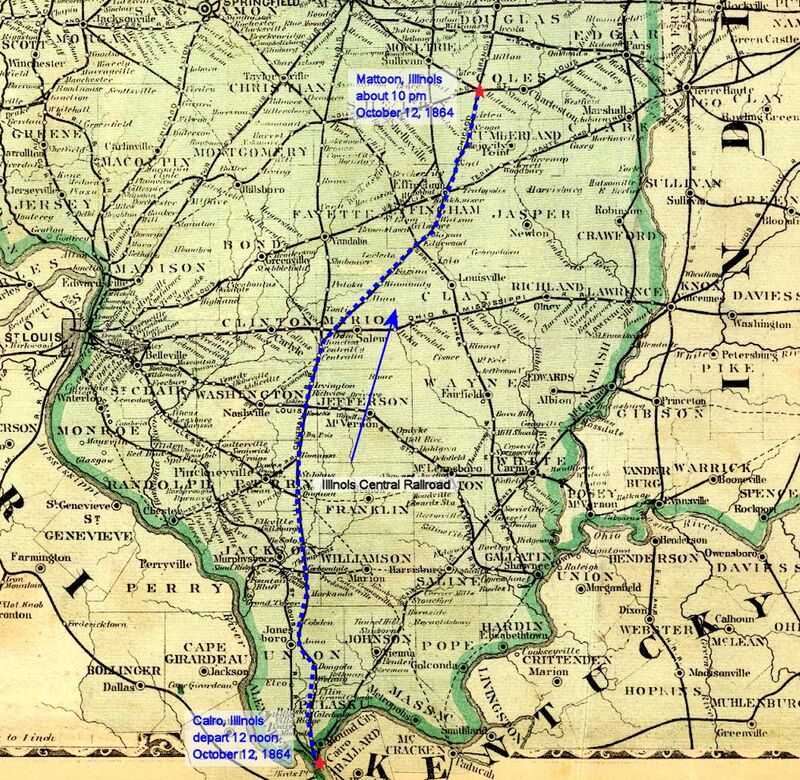 Here, the troops transferred to railroad cars of the Illinois Central Railroad and headed north and east toward Ohio, arriving in Mattoon, Illinois, on the night of October 12, 1864.. See second map for route continuation beyond Cairo. Continuing the trip home, on October 12, 1864, the regiment boarded the Illinois Central Railroad at noon and travelled north to Mattoon, Illinois. A rough estimate puts them arriving at about 10:00 pm in the evening. We are told the regiment "changed cars" in Mattoon. Research suggests they would have changed to the St. Louis, Alton and Terre Haute Railroad, then so named, which they would take the next day, east, to Indianapolis, Indiana, and beyond. 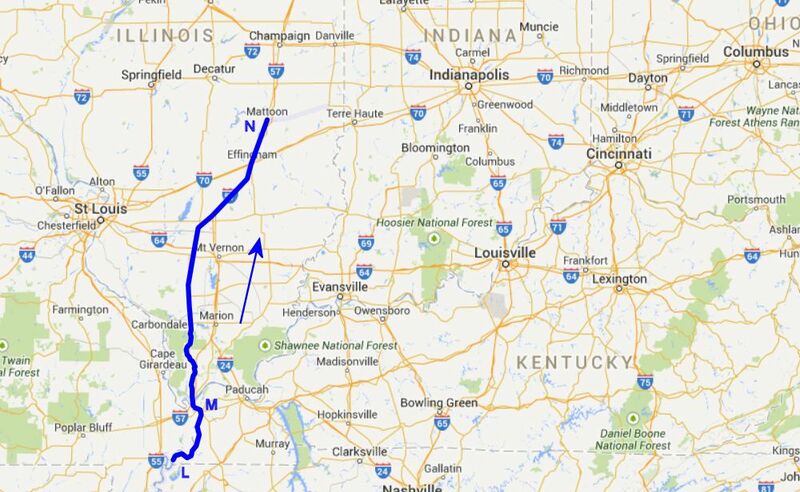 Modern day map showing the approximate route and location of the 16th Ohio on their trip home from the war. L - Approximate point which the steamer Luminary reached about midnight on October 11, 1864. 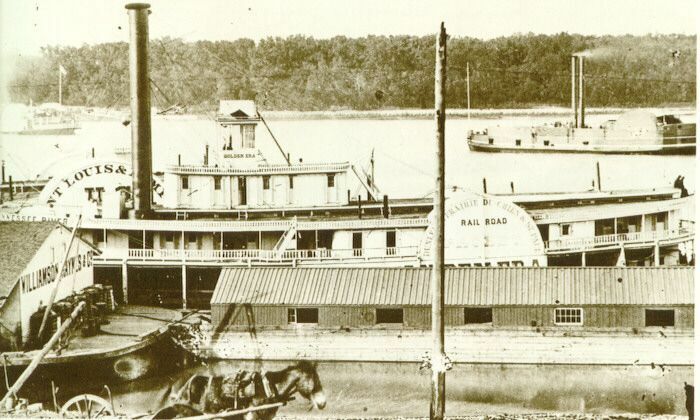 M - Cairo, Illinois, on the Ohio River, where the regiment arrived on board the steamer Luminary at daybreak on October 12, 1864. N - After boarding train cars of the Illinois Central Railroad at noon, October 12, 1864, the regiment travelled to Mattoon, Illinois, arriving late in the evening. We will make the assumption the troops did not leave Mattoon on the next leg of their journey until some time in the early morning of October 13. 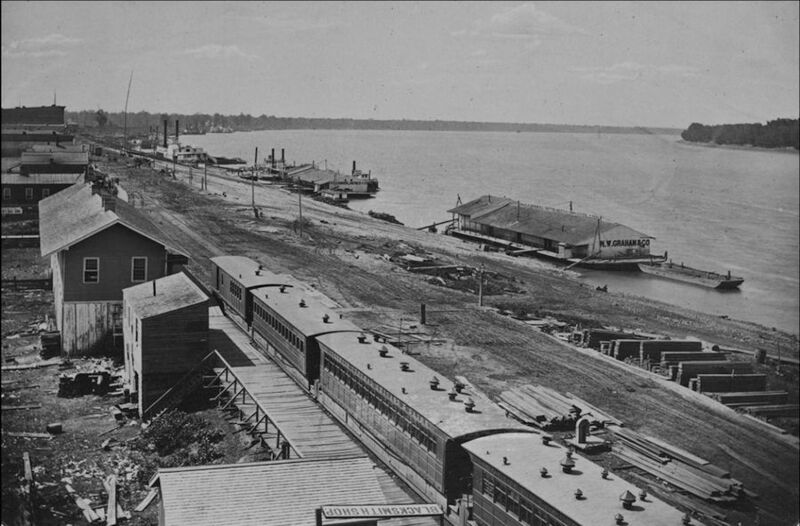 The riverfront at Cairo, Illinois, during Civil War.